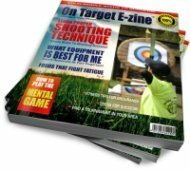 On this page you will learn about the Transfer and Hold step, which is the seventh basic archery step of the shot sequence. In this step you will learn how to transfer the draw weight of the bow from your arms and shoulders to your back muscles. This important archery step will allow you to use the alignment of your bone and joints to hold the bow weight more efficiently. Transferring the draw weight of the bow to the back muscles also helps you to be more stable and "firm up" your anchor. 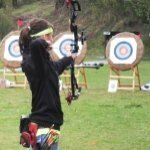 While this is among the hardest steps to perform for new archers, it is also one of the most important steps to master if you hope to achieve consistent performance. • Bow Arm: Is your elbow rotated so the inside joint of the elbow is pointing straight up and down? • Shoulders: Both shoulders should be down. • Grip: If you find it necessary to reposition your grip hand you should carefully let-down and begin the process over. • Is your drawing hand forearm parallel with the arrow shaft? • Is your weight evenly distributed on both feet? • Is your anchor position correct and hand pressed firmly against the side of your face? From the full draw position, transfer the draw weight of the bow from your arms and shoulder into your back. To achieve this action you will align the bow arm and shoulder through your chest to be in-line with the drawing arm shoulder. A slight rotation of the upper torso (chest and ribs) will aid in aligning the shoulders. This action also requires rotating the scapula of the drawing arm toward the spine. Move your drawing arm elbow directly behind the arrow. Hold this position with your back muscles. The forearm and the back of your drawing hand should be relaxed. The transfer and hold step is difficult to understand and even more difficult to perform for the newly initiated archer. Like any sport, archery can have its frustrations. Approach this step slow and easy and focus on the process. The bow arm shoulder should remain stationary. Imagine that you are pinching the muscles in the back between the drawing arm scapula and the spine - Alternatively, if you can focus on contracting the bicep of the drawing arm you will feel a similar sensation of rotating the scapula toward the spine. Most of the draw weight should be held with the back muscles. The remaining portion of draw weight (approximately 5%) will be held with the hand and arm. Have A Question About The Transfer And Hold Step?